Whenever you are running an email campaign, you should be well aware that the emails send by you are reaching the subscriber’s inbox, instead of the spam or junk folder. Successful delivery of the email messages into the inbox of the audience is the foremost step of the email marketing campaign. After sending the message, you immediately check out the delivery report to see whether the message has been successfully delivered or not. But, even after sending the email to a bulk of people, you are not getting a response from the consumers, then there is need to worry. 1.Does the customer read my email message? 2.Does the information provided in the mail was vital? 3.To how many persons, does we try to contact? 4.Do the customers are not happy with our proffered services? The list of questions is endless to ask yourself when the email campaign doesn’t run. The first step to check is, whether the email reaches the public. If the answer is yes, then where does the email falls, either in inbox or spam. After searching, you will get to know that the valuable email whom you compose, was either not being delivered or else if it is delivered, then it is in spam or junk folder. Therefore, the customer was not able to read the message at last. For resolving these problems, Inbox Placement Rate (IPR) comes into play. It provides an improved solution that helps in putting the emails into the inbox, rather than elsewhere in the email. For understanding the things better, let’s take a practical example. Suppose you are the brand ambassador of an email marketing campaign. Then, your first most task will be to lead a team of writers and designers under you. The team will be delivering you engaging content and striking designs to make your email campaign strong and powerful. After the preparation of mail campaign, the second task is to deliver the email to a number of subscribers who are in your contact database. Following steps of the procedure, you think the work is over from your side. But, there is a lot more work remaining after sending the email. Through, this in-depth analysis, we came to know, that the marketers do their job well done by sending the emails to the contact database. But, only 90 % of subscribers got the email. 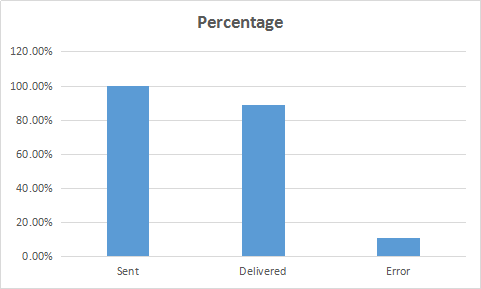 The remaining 10 % didn’t received it due to non-delivery, failure in network or the email was being spent to the spam or junk folder which is equivalent considered to as no message received. For sorting out this problem, Inbox Placement rate is being used. This clearly tells the deliverability rate of the emails. Through this, you will get a number of ideas and methods to enrich your marketing program. At present, we are living in a technology-friendly world where the people are using smartphones or tablets for viewing the email message. Let us now check out the email delivery service provided by the top email companies. 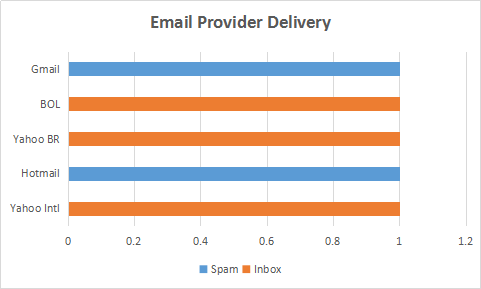 By deeply going through this chart, we came to know that emails generated by the marketers are going into the spam. Here are a few reasons, that are the main causes for considering an email as spam by the people. 1.Having bad reputation among the public. 2.Due to invalid or unknown email. 3.Weak content was used in the email. Things to be strictly noted is that the spam complaints comes from the real people not from the servers. Hence, it is a strong indicator that the mail from this email sender is especially not wanted. Therefore, the reputation of your brand among the public plays a huge role.